Celebration of Tenchosetsu, Emperor of Japan's birthday, in garden under a tree at the Consul General of Japan's residence in Pasadena, California, April 29, 1969. 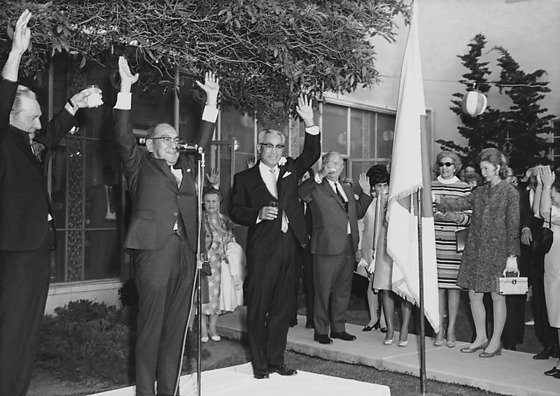 Consul General Kanji Takasugi and Los Angeles Mayor Sam Yorty, both in suits, toast Emperor on white platform with Japanese and American flags as group of Japanese and Caucasian men and women stand at right toasting and observing. Also includes a toast with raised arms led by a Japanese man at microphone. Typed on original envelope: Tenchoo Setsu.